Songwriting is now on the recreation calendar on a regular basis at United Hebrew of New Rochelle. The residents of the new nursing home and rehabilitation pavilion have been using their creative juices to write new songs. Mila Levine, director of recreation, leads a songwriting class at United Hebrew of New Rochelle. When Mila Levine began writing music, she never expected that it would be useful in her career. But as Director of Recreation at United Hebrew of New Rochelle, she has found her musical background to be a tremendous help in bringing the creative process to the residents. Songwriting is now on the recreation calendar on a regular basis at United Hebrew, where the residents of the new nursing home and rehabilitation pavilion use their creative juices to write new songs. Most of the residents have never had the opportunity to write lyrics, but they have a wealth of experiences from life that can be used. Ms. Levine is able to elicit emotions, memories and daily thoughts which can translate into new lyrics and a story. Ms. Levine decides on the style and rhythm to be used. 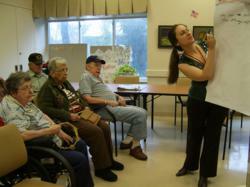 Then the residents start with writing the words and phrases. Ideas for melodies are sung out by the residents and even a segment of notes or a tune can become a larger piece. “The fun part is in the process of creating, but the biggest thrill is when we sing the final version together,” said 95 year old resident, Dominica Moruzzi. Songwriting and other programs such as music therapy, are examples of United Hebrew’s vision for enhancing life for its community of older adults. Professionals have shown that programs developed to improve mental stimulation and creative outlets in later life help to improve mental fitness and increase cognitive functioning. Research has shown that cognitive decline is not an inevitable part of the aging process. New findings in brain health research offer a striking model of aging as a time of brain health and growth resulting in an opportunity to lead qualitatively better lives filled with more knowledge, wisdom and song. United Hebrew is a vibrant not-for-profit, non-sectarian, multi-service senior living campus serving the Westchester metropolitan area since 1919. United Hebrew offers a rich array of skilled and community-based programs and services that encourages and supports a life of dignity and spirituality and promotes the highest possible quality of life. United Hebrew serves over 600 clients daily in its campus facilities -- Willow Towers, a 126-unit assisted living residence; a 296-bed nursing and rehabilitation center staffed with Burke Rehabilitation professionals; the 135-unit Soundview Apartments for seniors; a Long Term Home Health Care Program; and the AZOR Home Health Agency. United Hebrew which combines world class care with state-of-the-art features opened its new home in 2009. http://www.uhgc.org. For more information please call Linda Forman, Vice President of Community Relations, at 914.632.2804 x1224 or lforman (at) uhgc (dot) org.